Many of us who are over 50 have a good level of fitness and health, an active lifestyle and a positive attitude. We believe we can do any trek no matter how long or difficult it is. I happen to be one of those over 50s, and that’s why I have chosen to be a professional mountain guide! But some prefer mountain experiences at a slightly slower pace, with more rest days, better creature comforts, and the opportunity to learn more about the environment. – in winter, the trips are focused in snowy landscapes below 2000m. Walking in higher altitudes increases the risk of avalanche. However, in many places of Catalonia, out of the Pyrenees, there is no snow. That is the case in the Priorat, a region in the South of Catalonia mostly covered by vineyards except for the mountainous areas like the Montsant Natural Park, a mountain range with deep ravines and high cliffs. – in spring, we focus on flora, so we walk over passes, from one valley to another (colls in Catalan), to look for a different wildness experience. We always stay below 2200m, because snow caps remain until July at higher altitudes. – in summer, we look for peaks above 2500m and high mountain lakes. They can both be found in the Aigüestortes National Park and the Alt Pirineu Natural Park. We seek the infinite views from the high points, so the trips are more challenging. – in autumn, the deciduous forests offer us an awesome variety of colours, always below 1500m. 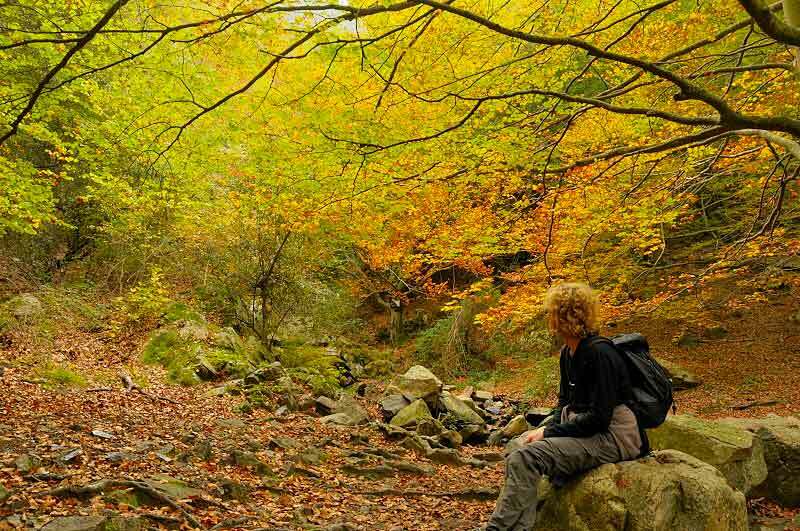 We can walk in the different Natural Parks located near Barcelona: Montseny, Sant Llorenç de Munt and Montserrat. – in the Pyrenean Ripollès you can make organic cheese on an isolated small farm run by Josep, a farmer who fell in love with cheese-making. – in the same area, but this time in Ripoll, the capital, you pay a visit to Carles, one of the last butchers who still makes sausages manually. During our visit Carles cuts pork which has just been brought from the slaughterhouse. He explains what he makes with every piece. At the end of the visit we taste Carles’s products accompanied by Catalan red wine. – in la Cerdanya, another Catalan Pyrenean area, Arnau and his girlfriend, owners of a pretty village hotel, run a cuisine workshop where we learn to prepare local dishes. We do not just watch — we work in the kitchen! – in the Pallars Sobirà in the central Catalan Pyrenees, we visit Obrador Xisqueta, a local association which buys wool from shepherds for local makers to turn into clothes. That helps to preserve the xisqueta sheep breed, found only here and in Pallars Jussà and Alta Ribagorça in the Pyrenees. – also in the Pallars Sobirà, in the norther part in Tavascan, the last village up the Cardós valley, we visit a trout farm. Juli, the owner, carries on the business his parents started in the 1960s. Juli explains the hard work involved in keeping so many animals alive, in good health and naturally fed. The best restaurants and hotels in the Catalan Pyrenees are his main customers. To discover Tavascan, take a look at our picture gallery. >> Challenging: we walk longer than 7 hours and cumulative ascent is about 1000m or higher. Easy treks are devised for over 50s mountain lovers not used to walking regularly. Moderate treks are for those who exercise at least once a week and can walk for 6 hours without feeling too tired. Only people in a good shape can walk our challenging treks. That said, I should mention that nearly everybody can keep pace with the group, as it is continuous but slow. Don’t forget, I am also in my 50s. To make everything easer, our luggage is nearly always carried by a taxi, so the rucksack we carry during our hikes is small and light. Only when we stay overnight at mountain huts do we carry our overnight kit in our rucksacks. Most of the time we stay overnight at small village hotels and village houses. I make sure that you enjoy excellent cuisine and stay in comfortable en-suite bedrooms. Breakfasts, packed lunches and dinners are supplied by the inn. I take care we don’t get the same lunch every day. When somebody has a physical problem or is too tired, they can rest for a day or longer. The taxi which takes the luggage can drive them to the next inn. Please comment below on Guided Walking Treks for the Over 50s. 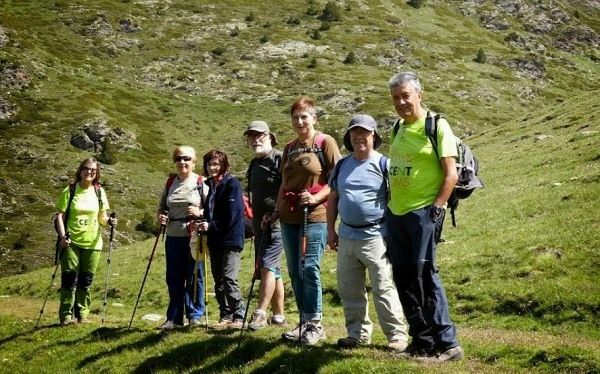 If you wish to travel to the Pyrenees and other mountains of Catalonia – see what tours we have for you or contact us here for any Pyrenees Tours questions you might have. Hola a todos, tengo de dejar una vida sedentaria y ponerme a caminar , vuestro grupo easy. Over 50 creo q podría empezar así,. Sin duda Matie. Te envío información por email.